Jazz performance requires fine tuning of the intellect intertwined with physical coordination on the highest level. The intellect has to have stored an incredible amount of technical and mathematical-like data to reproduce this information upon demand in the spontaneous jazz setting. Improvisation is a strange sort of art form. It involves knowing your instrument well, knowing the song you are playing inside and out – and knowing a whole lot about the options that this song, its style, tempo, culture, tradition, etc. give you in improvising a solo. “Talent” is taking all of the above and moving it from the conscious mind to the subconscious mind. Working musicians can and do get lazy. It’s really easy to fall into the trap of playing the same basic solo over and over – the same licks over the same chord progressions. Your subconscious does all of the work, and you spend your time watching the crowd, wondering how long the set will last, what you’re doing after the show. In short, it’s easy to make it a “job” – like any other job out there. If you’re good at taking risks with your playing – you become known as an “exciting” player. If you go too far, your Avant garde ideas fall on deaf ears, and people quickly develop opinions about you and your playing – none of them too flattering. If you don’t take risks, you either become boring or a top 40 artist whose fans hate it when the “live” version of your hit doesn’t sound exactly like the studio recording. Risks in jazz improvement can be taken at many levels – changing the standard chords, changing the “normal” scales that are played on top of those chords, changing the tempo making the song dramatically faster or slower, changing the style… there hundreds of choices that can increase risk. Usually, when a fan notices an improviser “taking risks,” he hears notes that don’t quite a sound right to his ear. They are not necessarily “wrong” notes – but they certainly don’t sound like what we expect to hear. Often, one fan will hear what he thinks are risky ideas while another (more familiar with the ideas) hears the “same old thing.” Knowing your audience, knowing what’s been done before with a particular song or style, are basics for creating more risk in playing jazz. Improvisation also demands immediate problem-solving abilities to delineate the proper responses to both the musical challenges inherent in the music itself as well as the reactions necessary for handling the possibilities and consequences of group interaction. It goes without saying that manual dexterity, the range of which depends upon the specific instrument, is taken for granted. In common with some team sports, combining mind and body into a smooth and unified flow is an ongoing process and challenge for the improviser. There is also the matter of simultaneously expressing thought and feeling. In a musical gesture, how much is a mental cognition versus raw feeling? Does the improvising artist know exactly what he is doing every moment of the way? Does it matter? In the final analysis, of course, it is the listener’s reaction that is paramount, but these questions do permeate an improviser’s world. On another level as compared to other forms of music, classical, the world, pop, jazz is an inclusive music borrowing from all sources, both the musical and real world to inspire ideas. Jazz musicians are by and large among the most welcoming of artists to gaining inspiration from other sources. 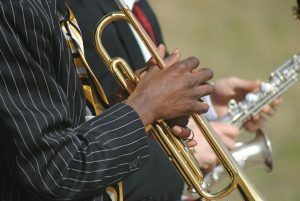 Jazz music conveys a positive energy that serves as a beacon of light for all to feel and recognize. Here is more information about jazz bands on wikipedia.